OCCC President Paul Sechrist thanked The Leadership Council several times during an Oct. 14 meeting for raising $8 million to construct the Visual and Performing Arts Theater. Sechrist said about four years ago, TLC student leaders agreed to increase tuition by $3 per credit hour to raise the money for the theater. The commitment from students made it possible for Sechrist to attend foundations in the community to help raise some of the remaining funds needed for the construction, he said. The tuition increase raised half of the $16 million needed for the theater, which had its official groundbreaking ceremony on Oct. 7, Sechrist said. He said construction for the new theater is set to begin in spring of next year and is expected to be completed by Dec. 2012. A wall recognizing donors in the lobby of the theater will include the students’ names, Sechrist said. “We’ve got a foundation that gave a million dollars, we’ve got one that gave half a million dollars, but the students gave $8 million,” he said. In addition to the theater groundbreaking, Sechrist also talked about the new Family and Community Education Center childcare center, which is planned to open in January in the old John Glenn Elementary School building, about a mile north of campus. The Aug. 1 tobacco-free policy was briefly mentioned, but Sechrist made it clear the policy was not open for debate and that it had been decided by the OCCC Board of Regents. OCCC has seen about a 24 percent increase in enrollment in the past two years, he said. Last year, Sechrist said, OCCC exceeded the University of Central Oklahoma in enrollment. Based on those figures, he said, OCCC is the fourth-largest college in Oklahoma. 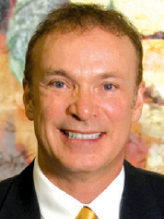 Sechrist has been president of OCCC since 2006. He holds degrees in communication from Southern Nazarene University and a doctorate from the University of Oklahoma. The Leadership Council is made up of officers of campus clubs and other interested students who want to volunteer. The group usually meets twice a month at 12:30 p.m. on Thursdays. For more information about The Leadership Council, contact Erin Logan at 405-682-1611 ext. 7821 or e-mail elogan@occc.edu.